(1991) Many accounts have been voiced and many histories have been recorded depicting the roots of our fair city and our parish. It is only fitting and proper that on the occasion of the City of Belén's 250th anniversary we review and transcribe are reminder of our beginnings. Belén was established as a royal grant in 1741 by Diego Torres and Antonio de Salazar. The town included twenty-seven men and five women. The town grant was named Nuestra Señora de Belén, which was later shortened to Belén. What a sweet tribute our forefathers gave the Mother of Jesus when they named their town after the birthplace of her son, Jesus. Our forefather's firm faith and insight has been rewarded a hundred-fold by the blessings our Lady has showered on Our Lady of Belén Parish. Although the town was officially established in 1741, Belén did not have a resident pastor. Prior to this and for fifty-two years, Belén was spiritually served by the Padres of Isleta. This period was called the Vista Period. In 1793, the Parish received its blessing from Our Lady. Parochial life began for Belén Catholics with the appointment of Fray Cayetano Jose Ignacio Bernal as pastor. The Presentation, or official act of creating a parish involved a ceremony of presenting a book of parish records to the new pastor. The presentation was administered by Lieutenant Don Jose Francisco Pino and it marked the beginning of the Spanish-Franciscan Period which lasted until 1826. Records of this period, for the most part, were destroyed or lost. However, we do know Fray Cayetano's first endeavor was to build a church. The church was built in mission style with thick adobe walls and twin towers. It was located at the Plaza Vieja, just East of the overpass on Reinken Avenue. The church was a joy to the community and a source of pride to Fray Cayetano. In 1826, the faithful of Belén began a third period of parochial life under the guidance of the Spanish-American Secular Priests. The Secular Priests were members of the Santa Fe Diocese and all were native to this area. Fray Vicente Chavez was first pastor and was succeeded by a series of other priests which ended with Fray Bruno Gonzales. The priests of this era shared and cultivated the land while trying to guide and protect Belén citizens. They also undertook dangerous journeys through surrounding areas for the purpose of evangelizing the Native Americans. During this period (1826 - 1853), liturgy services were held in the Plaza Vieja Church. There are no records showing the exact date the church was built. Records, of course, were scant as people were too busy cultivating for survival to take pen in hand. Blessings from Our Lady continued in 1853 when the French Secular Priests with their French inspirations and influence replaced the Spanish-American Priests. No reason is given in records for the replacement. None other than that Archbishop Lamy had been to France and had returned with several French priests. The people warmly welcomed them and were eager to learn their culture and expertise. Father Joseph Machebeuf was the first French Pastor. In his first year as pastor, problems arose with the rising and flooding Rio Grande River which was damaging the church. Mr. Machebeuf returned to France within a year, due to poor health, leaving the collapsing church to Father Paulet. The church finally collapsed on June 27, 1855, when Spring runoff was too high and flood waters destroyed the church. Father Paulet immediately decided to build a new church, designing it after a Gothic structure in his native France. In the midst of his plans, he encountered a hot disagreement as to the location of the church. Plaza Vieja residents wanted it in the original location in spite of the threatening Rio Grande River. New Town residents wanted it in a location in their location, less likely to be flooded. The disputes were so heated that someone took the vestments and sacred instruments from the church. Hearing of this, Archbishop Lamy threatened to excommunicate the person (s) responsible if the church articles weren't returned. Through his intervention, the dispute was settled with a decree from him that the church be built in New Town. This now settled, the residents of Old and New Town cheerfully engaged in building the new church. 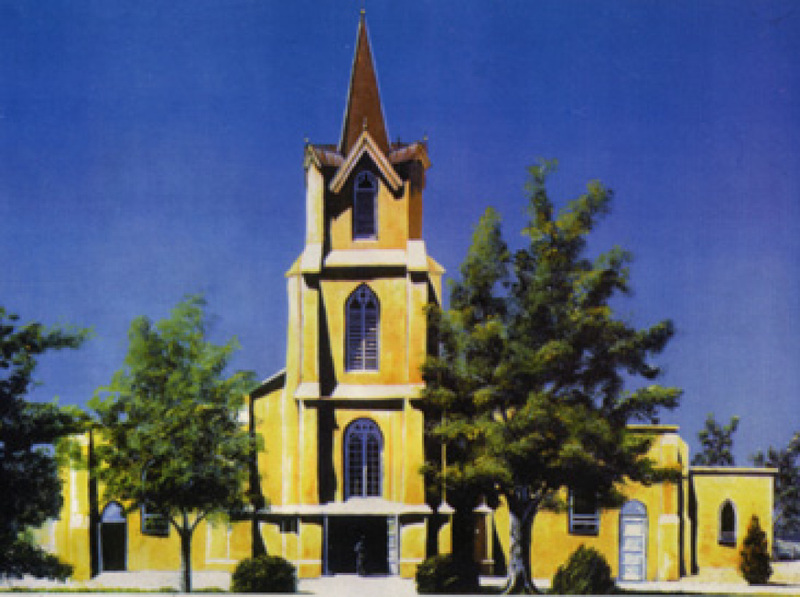 The new church was blessed on November 19, 1860 by Bishop Lamy. A new bell was donated by Don Antonio Chavez and his spouse, who were padriños at the time. The bell was purchased in Cincinnati, Ohio and brought over the Santa Fe Trail. Other French priests contributed much to the establishment of a secure parish. Father Francisco Gatignol brought the Sisters of Mercy to teach the local children. Father Juan Anthony Picard was a very popular priest who served from 1901 - 1916. He not only was pastor of the church, but was involved as board member for the Belén Public Schools and served as Town Marshal. In 1917, Father Picard was succeeded by Father Antonio Cellier. Father Cellier, realizing the impending growth of the town due to the coming of the railroad, set about to enlarge the church. The church's beauty surpassed all churches in New Mexico. He also started a parochial school in 1927, namely St. Mary's School, under the guidance of the Ursuline Sisters. Father Cellier was dearly loved by the parishioners of Belén, although he, too, had to return to France as a result of poor health. The French Period lasted 24 years. Father Martin Jenco, OSM Last pastor in first Servite period - 1979 to 1981 Worked for Catholic Relief Services -Kidnapped in Lebanon and released 19 months later. Father Stephen Schultz Return of diocesan priests. Our new pastor; Fr. Steve evolved the stewardship project into a rare art -- deleting all extraneous fundraisers for the parish.